It’s been a long time since I did a Bits and Bobs update, the end of the summer actually. At the end of September my father-in-law was in his final days in the hospice so it didn’t feel right to post, then October and November passed us by. I kept thinking the last few months “I should post a Bits and Bobs” but then the weeks would just fly by – what with Christmas, then being heavily pregnant and at the end of January I was somewhat busy as Finn Boaz was born on 1st February! So here we are finally! February was as busier than any month recently in many ways - although Daniel didn't have many appointments, Colin started his masters degree on 31st January and had a residential for it in the middle of the month. He also is in the middle of a promotion board at work, Daniel was off school a few days for half term and throw in a newborn and the month flew by. Can I have a WOOHOO for the fact the first morning I'd to get all of us up and dressed and out to school by myself we were EARLY?! Two mornings in a row by myself went fine. Colin even arranged for his mum to come round at 7.45am in case I needed help to get a shower and she arrived to a house where all of us were dressed and ready to go an hour early! I’m learning again how everyone has their own challenges at different stages and I shouldn’t project my own experiences onto others. I found the transition to motherhood rather easy and am surprised by those who seem to really struggle when they’ve “only one”. For me, the challenges came when we went from one to two, probably with the many other issues going on at that time (an almost three year old who still couldn’t go up and down stairs, fell regularly and had numerous appointments and an intensive therapy schedule – a husband who’d been in hospital three times during the latter part of my pregnancy and went on to be admitted twice more in those early months with two – a very difficult baby with undiagnosed allergies and latterly growth problems). This time round – going from two to three – I’ve found ok, but I spoke to another mum the other day who said going to three was her toughest. So I’m learning to just give everyone on this journey a bit more grace for what they’re struggling with in motherhood. Call The Midwife is back, yay! I’m not a big TV watcher but I adore this show for its simple, uplifting and really thoughtful approach to many difficult topics. There are sad episodes but most are heartwarming and make you feel so much better about the world. Plus they’ve featured a number of storylines with people with Down Syndrome and done so in a really sensitive way. I watched last week’s at 4am on Monday with my middle boy (he’s 2 and a half) and he loved it too. He’s a big fan of babies and how they’re born! So it turns out “nesting” for me means cleaning. I was obsessed in the last few weeks of this pregnancy. Hoovering the floor three times a day, steam mopping the hall (I mean, who does that?!) and cleaning the bath daily. But I could not sort any of the clutter. Our front room and study were piled high of boxes I couldn’t even get my mind round sorted. I would just stare at stuff and could not work out what needed dumped! Since Finn has arrived the bar for cleanliness has dropped but I suddenly have energy and clarity to sort the piles. How weird is that? Hormones? Who knows…! Over the past few months we have been really enjoying getting to know both our older boys better. Daniel has started to communicate more and has started some running jokes. Every morning once Colin puts Daniel’s hearing aids in he whispers in Daniel’s ears “Can you hear me?” and Daniel says “No!” in reply. It’s a lovely wee joke between them. He's also started talking about more than "playing" when you ask what he's done in school each day. He is loving being able to read and write and count. So wonderful to watch him learn! Oh my. His teenage years will be a challenge! He is a proper little chatterbox now and every day his speech becomes more advanced. It’s really helping Daniel form more complex sentences too. And it is lovely to have a child whose language is so good. I feel in many ways I know him so much better than Daniel because he can tell me so much. The things he loves, what he’s disappointed by, even his ability to show real gratitude “Oh mummy, I love this dinner, thank you very much!”. Our big parenting task is coming up though, I plan over Easter to try and potty train both of the elder two. Rory is meant to be starting playgroup in late April and is in theory meant to be potty trained (and in fairness, no nursery setting is going to agree to change his dirty nappies – they are horrendous) and we really need to have a proper go with Daniel again. He’s been in nappies full time for over a year after a real regression which turns out was down to severe constipation due to medication he takes. When he started on the medication we weren’t informed of the side effects though and his nursery, and therefore us, started treating the regression as a behavioural issue, not a medical one. I feel we’ve let him down (by being let down ourselves) and we still haven’t resolved the constipation so have to go and see our GP before we start. It feels like an insurmountable task at present and I get quite upset even thinking about how we’re going to start. I really found the end of my pregnancy a test of patience. Not knowing the day things would start got really annoying, trying to make arrangements for the days we had heavy snow and my parents wouldn’t have been able to get to us in time (as Colin’s mum was away for the month of January), hoping we made it to the many hospital appointments Daniel had, even the logistics when Colin needed the car for work one day to make sure he could get back quickly if labour started. 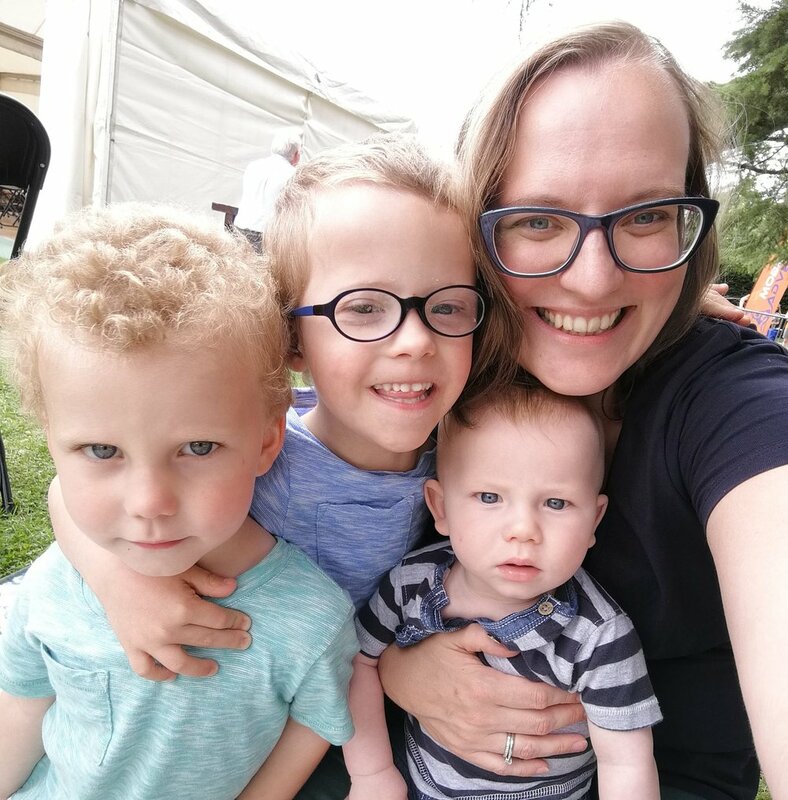 As it turns out, I went for my 41 week appointment on 1st February at 3pm, the midwife offered a sweep, which I accepted (first time with any of the boys I took the offer!) and within a couple of hours labour started and as I anticipated it went quickly – just 4.5 hours – although far from painlessly. That’s for another post. Anyway, I felt like I was having to pray over the logistics and timing and even position of baby (Finn only turned from breech at 38 weeks) regularly and just trust that God is in everything, even the little details around having babies. It would be so much easier if you could just know in advance “February 1st at 10.42pm” though, wouldn’t it??! This means if you click an amazon link and purchase the item I may receive a referral commission. There is no additional cost to you buying the item in question. Your support in purchasing any of these items helps me reduce the cost of my blog, Thank you!